When preparing a body for embalming, the Ancient Egyptians carefully entombed organs considered necessary for the afterlife with the body. The brain was considered dispensable and was pulled out of the skull with a hooked rod inserted through the nose (http://legacy.mos.org/quest/mummy.php). In this, the ancient Egyptians discovered something significant: it’s easy to get to the brain through the nose. This is true for both needles and odors. Nerves called olfactory sensory neurons project from the brain’s olfactory bulb through the thin cribriform plate into the nasal cavity (see Figure 1). OSNs are bipolar neurons and terminate in hairlike projections called dendrites, which contain smell receptors on one end and connect to the olfactory bulb, where smells are interpreted, on the other . The structural-functional two-fer of these olfactory neurons is unique and speaks to the importance of rapid recognition of scents and sense of smell. The ability to distinguish attractive molecules such as food and mating pheromones from repellent molecules such as toxins and predator scents is an existential issue. Since chemicals make up all matter, everything in the Universe leaves behind a chemical smell signature. Living organisms are themselves collections of chemicals – biomolecules containing hydrogen, oxygen, and nitrogen strung onto carbon scaffolding. Since water is abundant on Earth, the interaction between biomolecules and water highlights a fundamental property, namely their solubility or insolubility in water. [Note: A simple rule of hand allows one to identify soluble biomolecules which are polar from insoluble, nonpolar, biomolecules. Check the composition: if the biomolecule contains significant amounts of O or N in addition to C and H, then it is polar. Polar biomolecules dissolve in water; a useful mnemonic is that polar bears like water. Non-polar biomolecules mostly contain C and H and relatively little O or N. Non-polar molecules dissolve poorly in water but well in oils.] Odorant molecules are generally small; large molecules usually stay put and don’t get around much, and often their size precludes them from dissolving. Small odorant biomolecules, both polar and non-polar, are volatile – they are then called volatile organic compounds (VOCs). To summarize: two major kinds of molecules that are “smelly” are polar molecules that can dissolve in water, and volatile molecules that evaporate and circulate in air. These odorants can therefore span attractants such as pheromones and fragrances to attract mates and pollinators, and repellants to ward off predators. Note that chemosensors are present across the spectrum of living organisms, but are easiest to monitor in animals because they move towards or away from the stimulant. Once a chemosensor is activated, it functions like a doorbell: it signals an event occuring outside the cell to the cell’s interior. This typically happens by ions moving from one side of a membrane to another. Positive ions pile up on one side and negative ions on the other – this voltage difference causes one of two “signaling” actions: 1. An internal biochemical cascade leading to an action such as a movement towards or away from the chemical, or 2. An electric current (movement of charged particles) to be propagated. These actions cause unicellular organisms may move toward or away from the stimulus. In multicellular organisms, the movement of ions may cause a response both within the cell but also may be transmitted to adjacent cells. Cells that transmit current are nerves – specialized, elongated, insulated cells which rapidly conduct information or “action potentials” to and from the brain. Since the ability to sense chemicals in the environment is a fundamental issue, it is prevalent in both unicellular organisms, where it is called chemosensing, and multicellular organisms, where it takes on the moniker, smell. For aquatic organisms, the sense of smell and taste are interchangeable and interlocked since everything is washed in water. The distinction between taste and smell is a feature of terrestrial animals, where airbone volatile organic compounds that are released by foodstuff complement taste receptors. Land animals breathe air which is drawn through nasal and oral passages which have a layer of mucus on the surface of the neuroepithelium into which the olfactory neuron receptors project. Volatile molecules, being small, can sometimes be carried a long way through the air before they encounter olfactory neurons. This has prompted the evolution of two distinct olfactory regions in landlubbers – the olfactory neuroepithelium-olfactory bulb nexus for quotidian smells which serve as a trigger-response system, and the vomeronasal or Jacobson’s organ for pheromones which signal the presence of mate. In vertebrates, olfactory receptors are distributed in a portion of the respiratory epithelium called the olfactory epithelium. Animals that smell well, such as mice, have as much as three times as many receptors (~1200) in this region than humans (~400) . Neurons from the vomeronasal organ also project to the hypothalamus, activating the neuroendocrine system and sexual responses like ovulation. Neurons from the olfactory bulb project to the amygdala (emotion) and hippocampus (memory) of the limbic system indicating a more substantial interaction with primitive responses and emotions such as fear. Having said that, there are unresolved questions as to the presence of the vomeronasal organ in aquatic vertebrates such as fish, some birds, and even in humans. The take away appears to be that there are some indications of the presence of specialized structures that resemble the functional purpose of a vomeronasal organ . The answer has still to be sniffed out. Insects are largely terrestrial arthropods and, being innovators of life on land, have evolved two separate smell-sensing structures on their bodies. 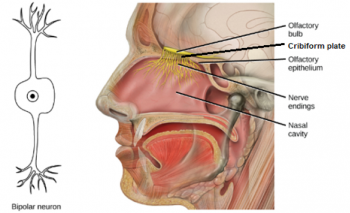 The majority of smell receptors are unsurprisingly located in projections called sensilla on the antennae, and the second is surprisingly located in mouthpart structures called the maxillary and labial palps. Mouthparts in insects are enormously varied, taking the shape of straws for sucking in butterflies, sponging mouthparts in flies and notorious hypodermic syringes in mosquitoes. In honeybees, the labium is modified into the tube and tongue for sucking and lapping nectar. Not to be outdone, there is also an enormous variety of antennae, and they have been adapted to different needs such as sensing CO2, pheromones, and volatile molecules . The major difference between mammals and insects is that odorants bind nerve ending receptors directly in mammals, but insects have an intermediate odorant binding protein to which the odorant binds and only then does the binding proteins bind to the olfactory neurons. This is probably because directly exposing delicate nerve endings to the air would cause them to dry out. Therefore, in insects, olfactory nerve endings are sheathed in cuticle and surrounded by blood-like hemocoel (in which the odorant binding proteins are present) to whisk the odorant to the olfactory neurons. Another interesting observation in insects is that olfactory neuron sensitivity is attuned to specific chemicals which are prolific in the insect’s ecological niche rather than to a variety of molecular signatures. This may be mediated by the presence of odorant binding proteins which bind to specific molecules. Smell processing occurs in the antennal lobe, the analog of the olfactory lobe of vertebrates. From the antennal lobe, neurons project into a brain structure called the “mushroom body” which integrates olfaction and learning. It turns out that insects (mosquitoes in the experiment) learn to associate attractive and aversive smells by using the neurotransmitter dopamine in a learning and reward system that shapes behavior. More dopamine is released with attractive smells, such as when the smell is delivered with a blood meal, than with aversive smells, when the smell is delivered with a swatting action . Rudyard Kipling was a well-traveled writer who once said, “The first condition of understanding a foreign country is to smell it.” Isn’t it ironic those Ancient Egyptians who outfitted their dead for a luxurious afterlife unwittingly deprived them of the very organ that made sense of everything? Firestein, S., How the olfactory system makes sense of scents. Nature, 2001. 413(6852): p. 211. Rinaldi, A., The scent of life: The exquisite complexity of the sense of smell in animals and humans. EMBO reports, 2007. 8(7): p. 629-633. D’Aniello, B., et al., The vomeronasal organ: a neglected organ. Frontiers in neuroanatomy, 2017. 11: p. 70. Hansson, B.S. and M.C. Stensmyr, Evolution of insect olfaction. Neuron, 2011. 72(5): p. 698-711. Stensmyr, M.C. and F. Maderspacher, Insect Olfaction: Once Swatted, Twice Shy. Current Biology, 2018. 28(3): p. R103-R105.